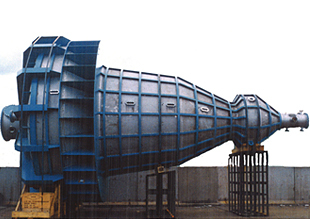 Reverse Conical (CEC) Crystallizer | KATSURAGI INDUSTORY CO.,LTD.- Dryers,Drum Flakers,Concentrators,Crystllizers. 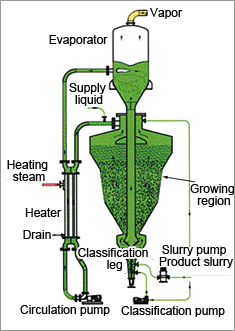 This is referred to as the classified fluidizing-layer crystallizer and is also called reverse conical one for its shape. Making good use of the principle that the larger the crystals are, the more rapid the falling velocity is, the shape is made in the form of reverse cone, allowing classification of the crystals while fluidizing them. In consequence crystals with sharp particle size distribution can be produced. Since crystals do not pass through the agitating wing and inside of the pump, excessive fine crystals are not generated. Thus, large crystals can be produced. At the same time, as it is possible to minimize engulfment of mother liquor into the crystals, highly-purified crystals can be obtained. Such characteristics can be utilized in recovering valuable matters from waste fluid containing a lot of impurities. Vacuum cooling, indirect cooling, reaction, as well as vacuum concentration methods are applicable.